If your wedding is coming up this fall, first let me say congratulations. 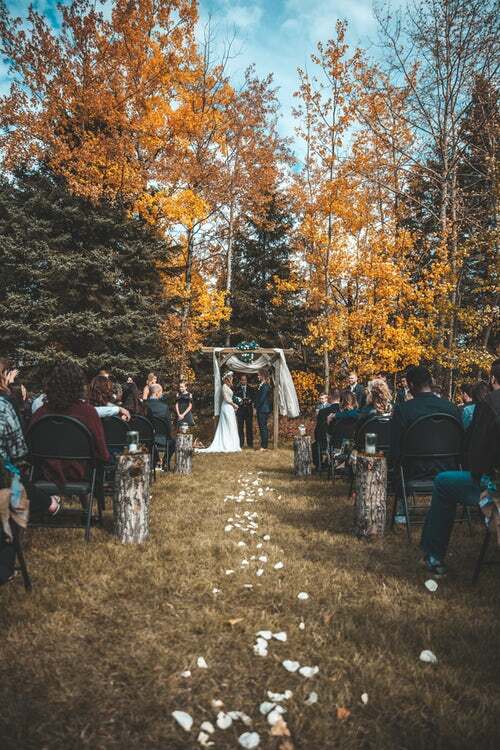 With the leaves turning into beautiful colors of red, orange, and yellow, autumn is the perfect time to have a wedding. If you are wanting your wedding to be creative, you may want to use straw bales for seating, arrange pumpkins around where you'll be getting married, and send out fall-themed invitations. One thing that may not have crossed your mind or that you are still thinking about is the table centerpiece. 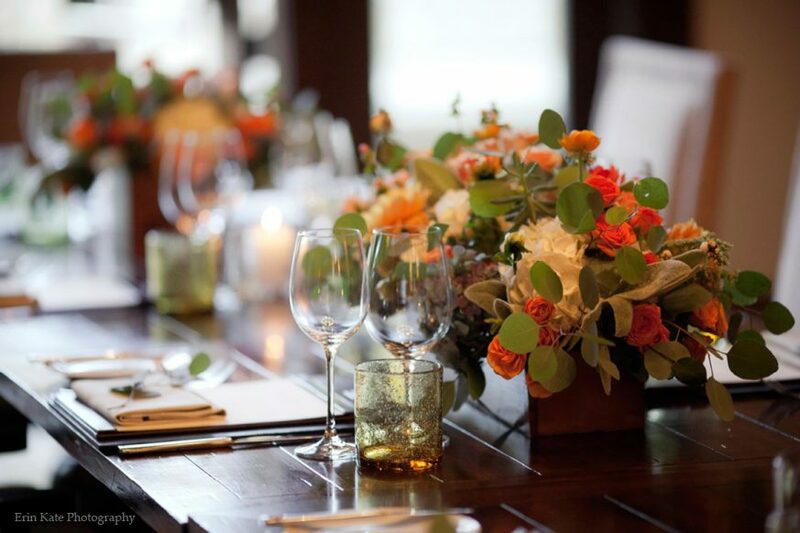 If you are having trouble deciding what fall wedding centerpieces you will have, worry no more. This article is all about different centerpieces you can use for your wedding. Enjoy looking through them, and hopefully you'll find one that fits your needs. Forget the vase, and instead use a pumpkin to hold the flowers. 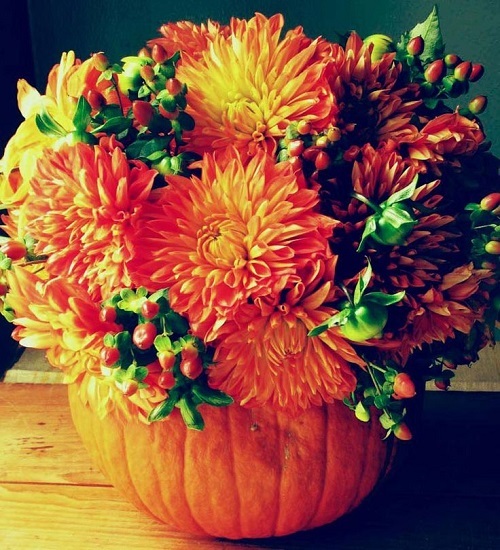 You will want to use flowers that are red, orange, and yellow, since those are the colors of fall. Succulents are perfect for fall weddings, since they grow anytime of the year. You can display succulents any way you'd like. 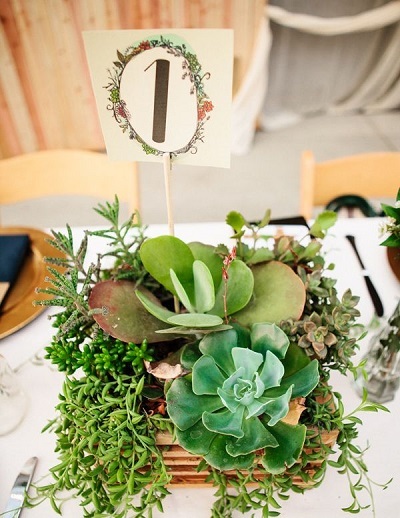 As you can see in the picture below, if you like rustic centerpieces you can place the succulents in rustic baskets. It is common for people to use mason jars instead of vases. Mason jars are pretty, inexpensive, and can add a rustic look to your wedding. But something that is not too common is to paint the mason jars. The nice thing about painting mason jars is that you can paint them in any color you'd like. 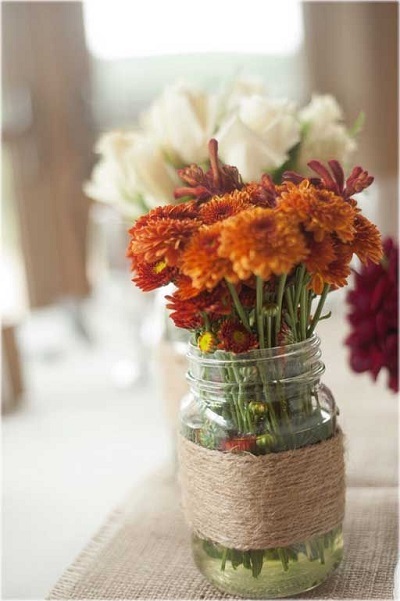 Because you are having a fall wedding, you'll want to paint the mason jars in fall colors. Pink, brown, and yellow are nice, mild colors to use. 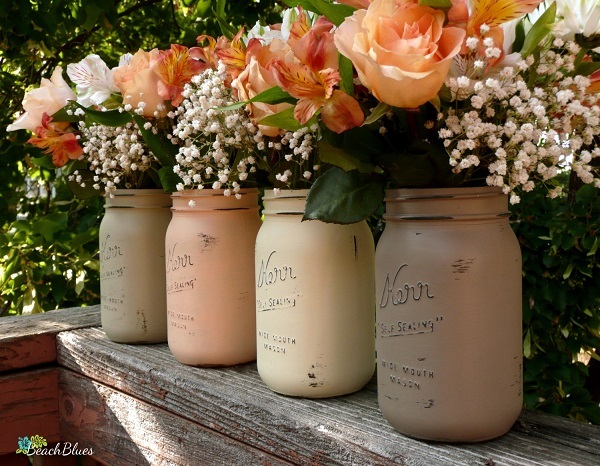 Complete your centerpiece by filling the mason jars with peach colored flowers and Baby's Breath. Pumpkin wedding centerpieces don't always have to be orange. Even glittery white pumpkins will do. 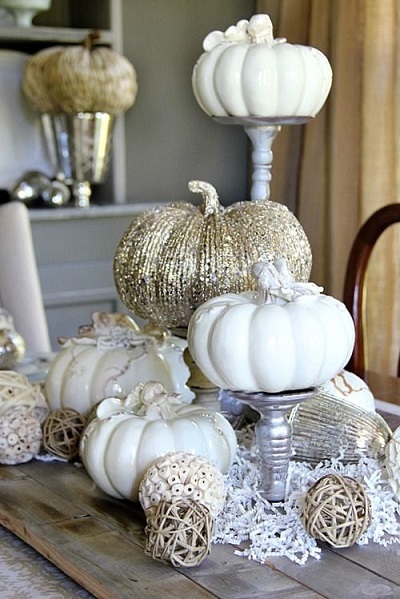 These glittery pumpkins have a vintage look. As you can see, you can decorate around it with items such as twig balls. Candles would also look nice around this display. Are rustic centerpieces your favorite type of centerpieces? If so, you'll love this next centerpiece. 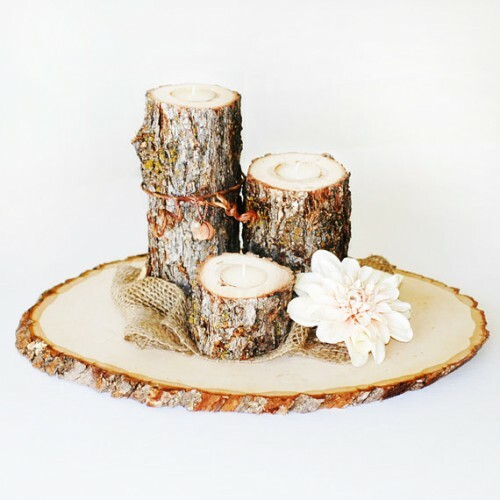 Made out of logs, these candles will add a rustic and creative look to the table. A wood slab will hold the three candles up, and it is painted in polyurethane for added durability. If wanted, you could probably stain the bottom wood slab too. Lastly, this rustic wedding centerpiece features a piece of burlap bag and a sola flower. The wooden candle on the left has twine wrapped around it for an even more rustic look. 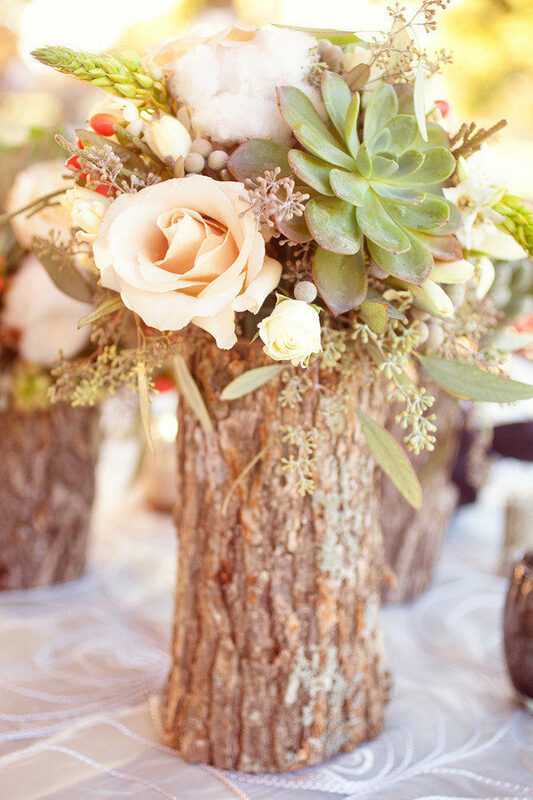 Continuing on with the rustic centerpieces, this wooden vase is definitely going to be a big hit at your wedding. In the vase there are flowers of many kinds, including succulents. This is another way to use mason jars at your wedding. Wrapped with twine, this mason jar vase has a rustic look. 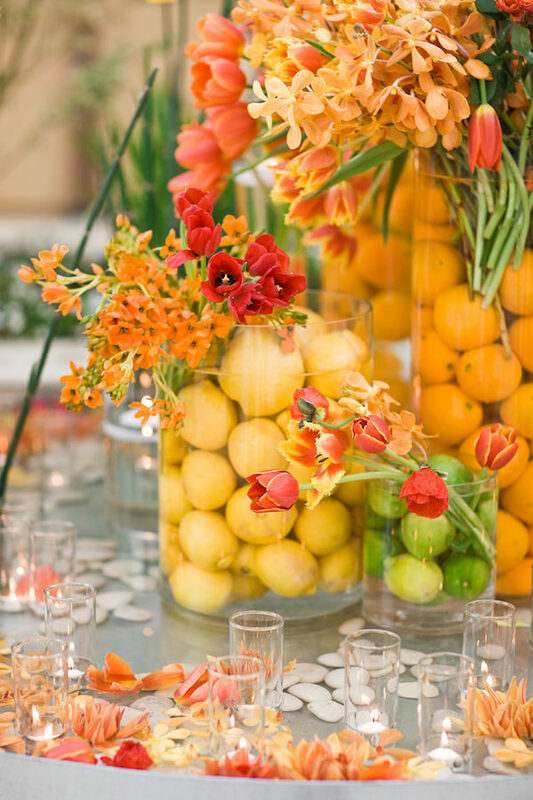 The orange flowers are what make this centerpiece match the colors of fall. Before you pour some water into the vases, consider filing them with lemons and oranges instead. Limes will also work well. After filling the vases with the citrus fruit, you can then add water to it. This will make your flower vases look more creative. Of course, make sure you use flowers that match the colors of fall. Orange flowers work well. A vase doesn't always have to hold flowers. Sometimes it can hold other things, such as pine cones, cranberries, rocks, and dried orange slices. 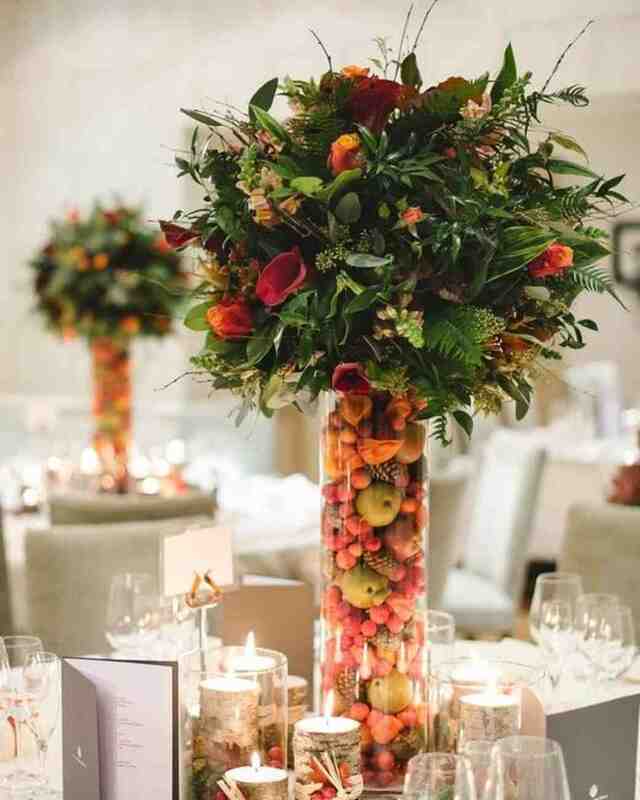 This combination of items will give your wedding table a natural autumn look. Are you not wanting to decorate with large pumpkins, or are large pumpkins hard to find in your area? Mini pumpkins will work just as well as large pumpkins. You can decorate them around the table in any way that you'd like. Some people have displayed them in a basket, while others have just scattered them around the table. You can decide what display you like better. After filling a vase with flowers, hide some mini pumpkins in the flowers. Maker sure they are displayed in such a way that they can be seen, but they are not falling out of the display. 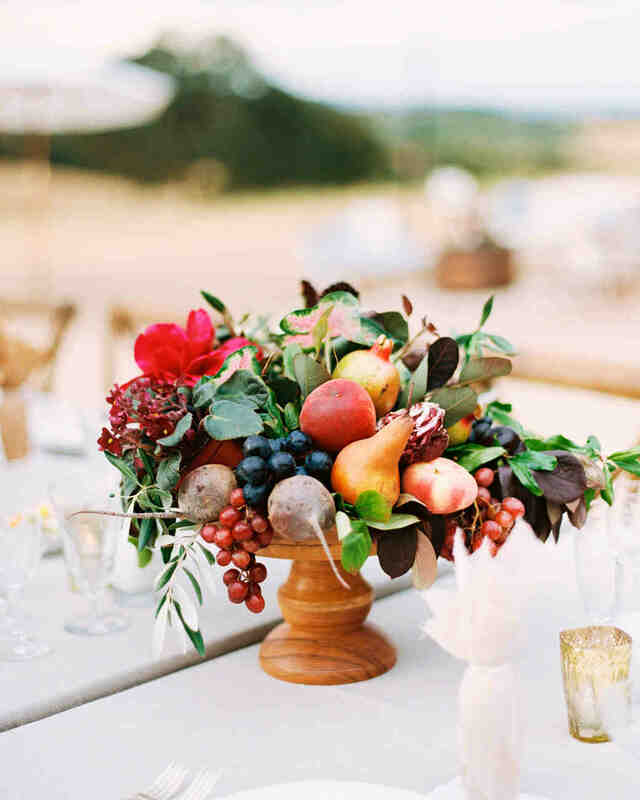 A large display of fruit and veggies may be exactly what your wedding needs. With a large display of pears, berries, apples, and beets, this fruity centerpiece will be adored by many. If having a large display of fruit and vegetables isn't exactly what you had in mind, consider displaying only one vegetable: the artichoke. 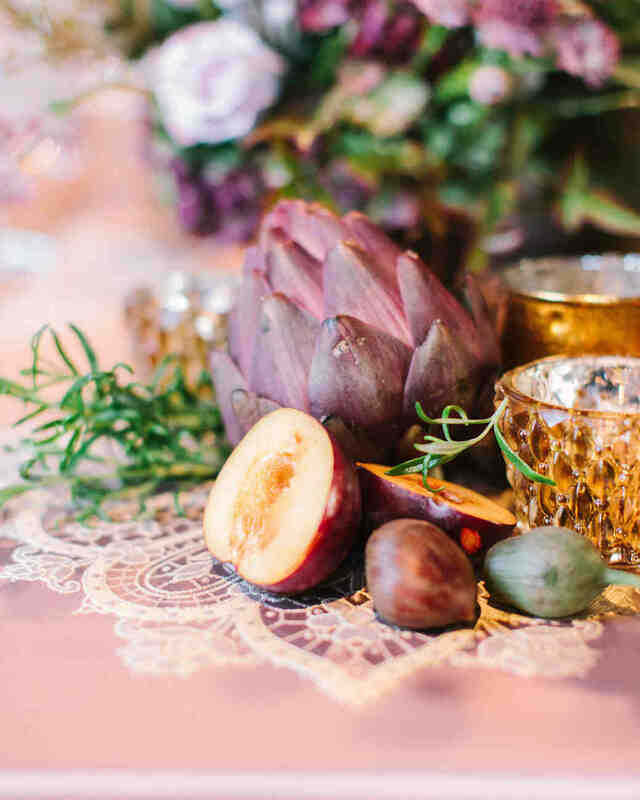 Some people place artichokes under the category as a flower, so this vegetable can replace the large bouquet that most wedding tables have. With its unique shape and look, artichokes are definitely worth displaying on the table. This is definitely a unique table centerpiece. First, the vase is full of green apples, pine cones, nuts, and berries. Next, a tall mixture of flowers are displayed in the vase. The display is mostly made out of green leaves/flowers, but there are also a few red and orange flowers peeking through. Besides the flowers being very tall, the vase is taller than most vases are. Because of the tall vase, you will need to use tall flowers. 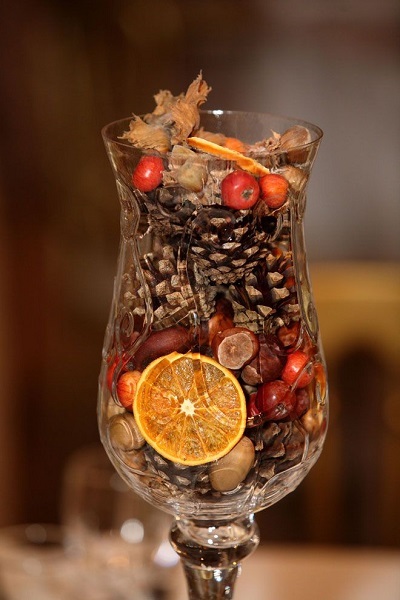 You'll also need more apples, pine cones, nuts, and berries than you would need for a small vase. But still, the extra work is worth it. Guests will be amazed with how tall this centerpiece is. Besides these fall wedding centerpieces, you'll also need to decorate your fall wedding with other decorations. Here are a few ideas. First, let's start with the best venue to choose for your fall wedding. Having your wedding outdoors will make the ceremony that much better. If you are worried about guests becoming cold, consider having space heaters outside, or having the reception be held indoors. Serve some fall foods that will warm people up, such as soups, hot chocolate, and wood fired pizzas. Toffee apples, pumpkin pie, s'mores, and apple cider are also great treats to serve. Of course, don't forget to decorate your cake in a fall style. Rugs will give your wedding decor a nice accent. You can choose any colored rugs you like, but red, orange, brown, and pink rugs are common since they match the colors of fall. Unlike summer weddings, you probably won't want to wear a wedding dress with short sleeves or no sleeves. Fall can bring cold weather, so you will probably want to wear a long sleeved wedding dress. Have a coat nearby for the reception. Light shades of pink, orange, and brown are great for your bridesmaids to wear. Consider choosing head crowns and flowers for them to hold that match their dress. A rustic wood table can resemble fall as well. You may want to have a burlap table runner be placed over the table. 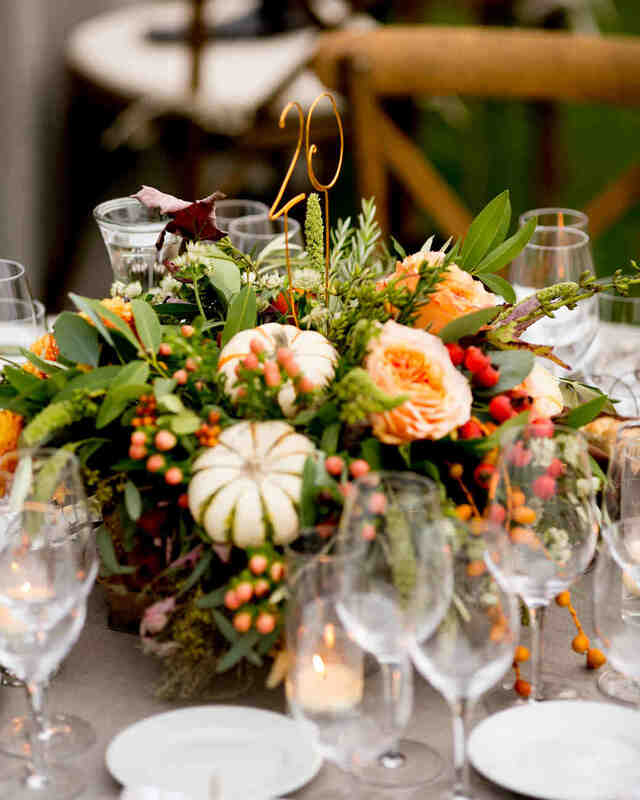 Don't forget to add the fall wedding centerpiece to the table. A fire pit will warm up the air, as well as be a great place for guests to gather for the wedding reception. Consider giving your guests s'mores to cook over the fire pit. Like I said earlier in this article, hay bales (or straw bales) will make your wedding look even better. Place some blankets on the hay bales so that guests don't get poked. There are many types of outdoor lights available. From Christmas lights to lanterns, outdoor lights can give your wedding a warm glow. Lights are especially important if you will be having your wedding late in the day. Besides fall lights, candles will add a warm glow to the wedding too. Candles can be a nice centerpiece on the table, as well as great to place around where the ceremony will be held. Or you cold line them up along where the bride will be walking up the aisle. Have the wedding invitations be orange, pink, or yellow colored. Fall invitations often have sayings such as "Fall in love together with their families", or "We fall in love a little more each day". I hope this article has helped you decide which fall wedding centerpieces you would like to have on your big day. As you can see, there are many to choose from. 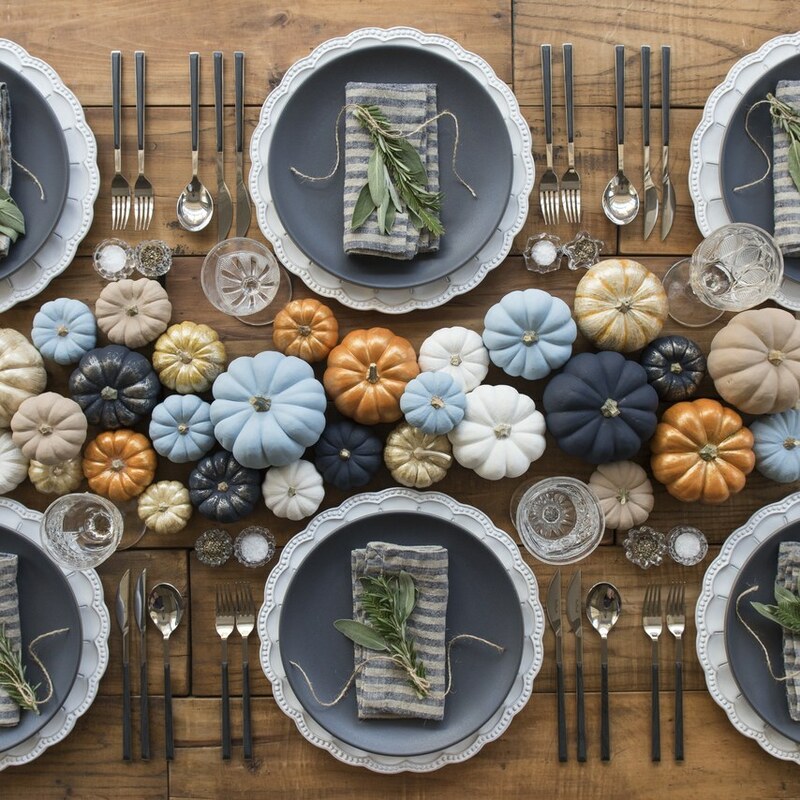 From succulents to flowers, from pumpkins to pine cones, the table centerpiece will show off your taste and style. Besides the centerpiece, I also gave a few other tips in this article on how to have a fall wedding. Make sure you dress for cold weather, as well as have proper light and heat ready. As for the seating, you can never go wrong with hay bales. Don't forget to send out fall invitations. Fall wedding invitations often have sayings such as "Falling in Love". I hope you have become inspired by this article, and I hope your big day is a success.